Welcome to the 2017 Indie Design Gift-A-Long! When scrolling through the rather extensive list of designers participating in the Indie Design GAL this year it’s hard not to notice that they are all spread wide across the globe. I want to present to you some designers that caught my attention from around the world. 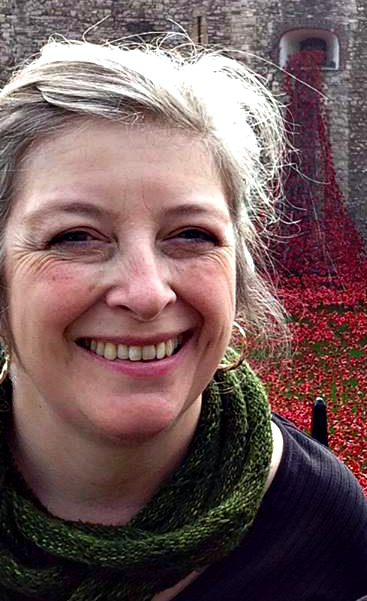 Meet Jo Torr (JoHT on Ravelry)! 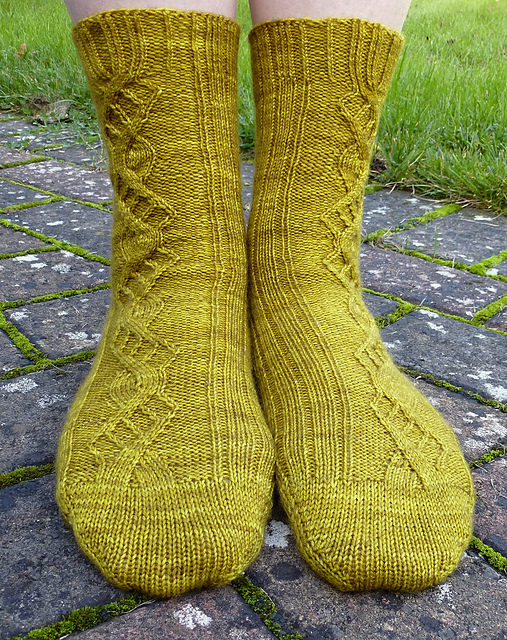 Jo will give away two of her patterns to two lucky readers of this blog. Find the questions you’ll need to answer in the end of this post and good luck! All you need is to post your answer in the comments below! Jo is from Reading, England, happily married and has three Burmese cats who give the family a mix of joy, frustration and heartache. When she is not knitting, she loves gardening and cooking and nothing is better than cooking something you’ve grown yourself. She designs mostly for herself, her husband, family and friends and always has an individual in mind when designing. She figures that if she herself, and that special person, like it then there will be other people that like it too. Most of her designs have inspiration in architecture, as she has always been drawn to strong lines and geometry. She really admires people that can bring nature into their work. 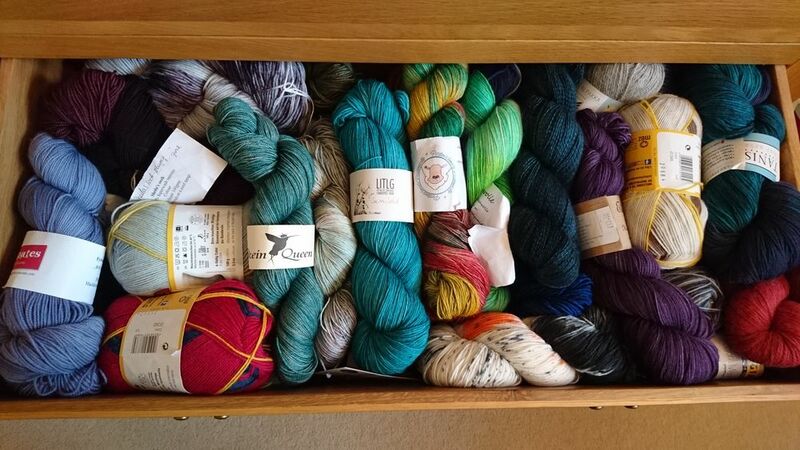 I have asked Jo, when she was first discovering her knitting and what her first ever design was. I’d spent a lot of time getting frustrated with fit issues from some patterns I’d made and decided that I should basically stop moaning and do something about it. To this day, fit is the very most important thing in my sock designs, that comes before everything. That pattern is getting quite old now and could probably do with an update to give it some better photos. The really exciting thing for me about that pattern was that I got a lovely note from Cat Bordhi, as I’d used one of her clever structural designs. All of it? Ha ha, not a chance! I have most of it listed on Ravelry. Here are a couple of photos of some of my stash. It’s all a bit scattered because I have to share this storage with my husband’s art supplies, so there are lots of other bits poked in spare corners; there’s quite a bit hidden in with the clean sheets! 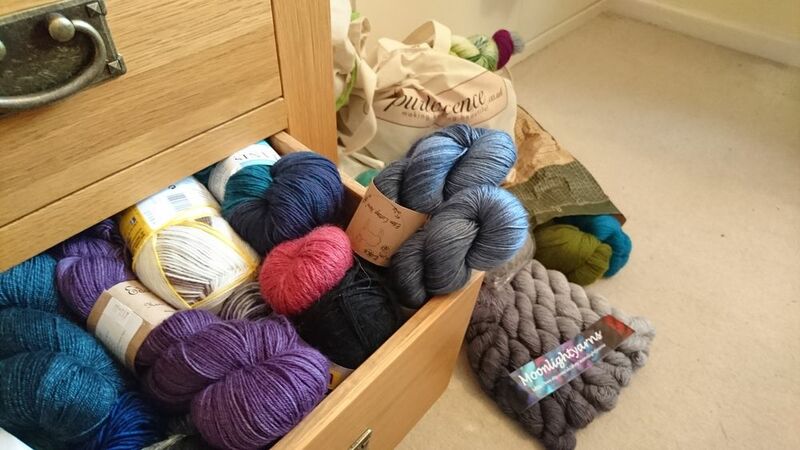 Also, as a (mostly) sock designer, scraps are invaluable for colourwork and sometimes they seem to take up as much space as full skeins, so my scrap stash is a separate monster in its own right. I’m always sucked in by colours, but what I really love are good tools. I recently bought a lovely magnetic wooden notions block from www.beyondmeasure.co.uk, which now means I’m far less likely to lose my stitch markers! I’ve cleared my needles of my own designs in time for the GAL, it’s a good chance to knit other people’s patterns. 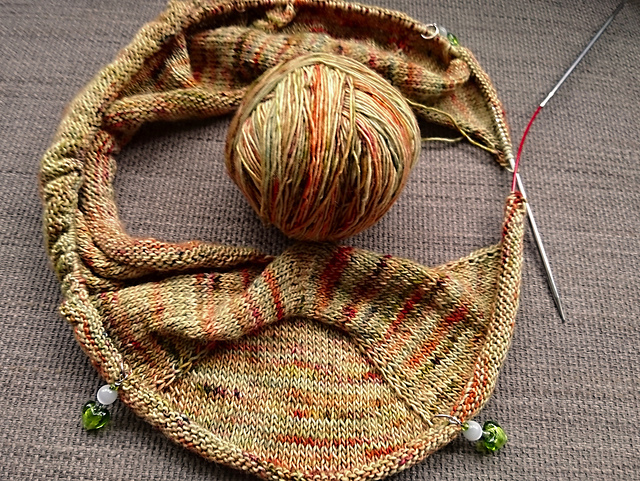 One thing I am working on though is a test knit for my friend Åsa (tricosa on Ravelry) who is working on a book. Her sweater designs are fabulous and a joy to knit. I love circular needles, especially Chiaogoo. The tips are nice and pointy and the cables have just the right balance of structure and flexibility. Do you have a partner-in-crime designer/critique/best friend that works with you ? Not designers, but some members of my Ravelry group are real life friends and I know I can always bounce ideas off them and get good feedback. My Mama Westray pattern came about because one of them had been badgering me to design a gansey inspired pattern, they were for her. 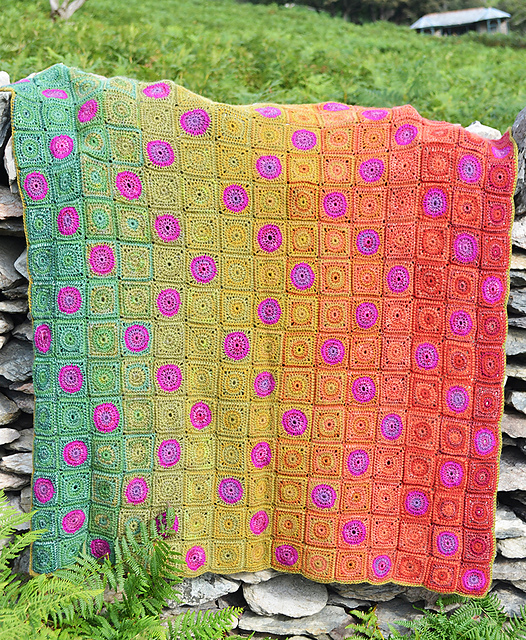 and Amanda Perkins (Queenieamanda) whose crochet blanket designs are just stunning. I may have to learn to crochet! Nothing definite yet, not until I’ve finished looking through the GAL offerings. 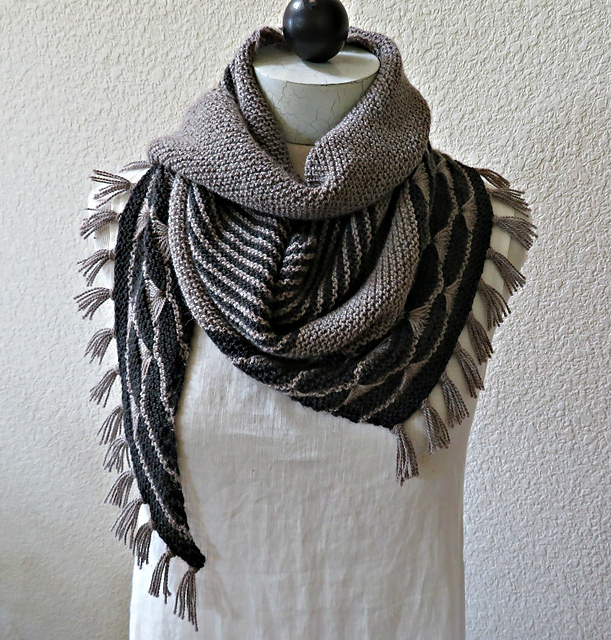 Beyond that I have some new shawl designs in the planning and a wild plan to design myself a fairisle cardigan. A good friend of mine is planning to launch a hand-dyed yarn business early next year (she’s very good), so look out for some exciting collaborations! Jo designed patterns for two fabulous yarn companies – Three Irish Girls and Artesano Yarns – for their monthly yarn clubs and as kits. Her patterns can all be found on Ravelry, Patternfish and Loveknitting, as well as on her website here. 1: Which of Jo’s patterns was named after a made up Scottish island? 2: Which of her patterns is named after a London tube station? It’s always fun to read what inspires people, so thank you for this interview! Such amazing designs as well! I just emailed you a coupon code for a pattern of your choice from Jo’s designs on Ravelry 🙂 Happy knitting! I’m really looking forward to this year’s GAL, I had such a lot of fun last year. I hope lots of people will come and join in! 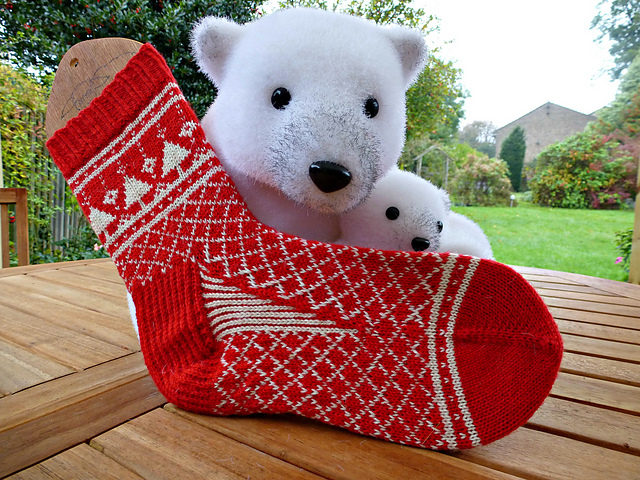 So wonderful socks! I hope to knit one of them soon. I love the idea of the magnetic notions block! The correct answers were Mama Westray and Perivale. Congratulations to the winners who each got one answer right. Your codes are valid until the end of March, I hope you’ll enjoy choosing and knitting one of my patterns. Thanks for you generosity, Jo! It was fun getting to know you a bit more!